← Keep the Winged Lion At Klarov! 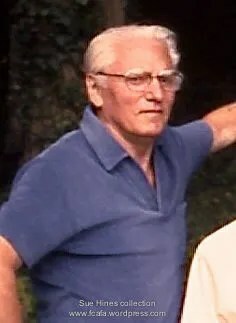 Ondřej Špaček survived two great ordeals: the catastrophe of World War II, and the onslaught of communism. The story of his life is a dramatic reflection of the forces that shaped twentieth century history. 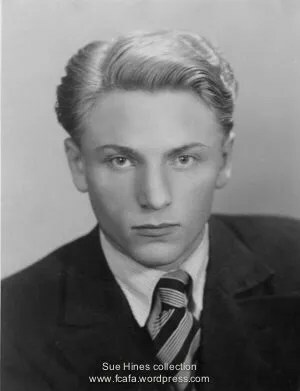 Ondřej Špaček was born on 11th October 1914 in the village of Lažánky, 10 miles or so from the city of Brno. His father, Josef, was a labourer who worked both on the land and at the local quarry. Ondřej’s mother (Josef’s second wife), Bohumila, was from the Šebetovsky family, which probably originated in Poland. There were four other children: Ludvik (Luďa), ten years older than Ondřej, and Josef’s only child by his first marriage; Věra, five years older, who lived on until shortly before her 101st birthday in 2010; and two younger brothers, František (Franta) and Jan, who both lived all their lives in Lažánky. Ondřej Špaček was baptised and brought up in the Catholic Church; when young, he was an altar boy at mass, although in later life he was not a churchgoer. Lažánky is situated high among wooded hills in Moravia, and when Ondřej was born it was still part of the Austro-Hungarian Empire. World War I had begun two months earlier, and his father was conscripted into the Czech Legion, spending much of the war far from home on the Russian front. Ondřej’s mother was left to bring up the family on her own in what were already difficult circumstances; village children spent much of the time barefoot and hungry. Though everyone kept a few chickens and geese, and sometimes a pig, food was scarce; sucking a potato dipped in sugar was a treat for them. Each house depended for heat and cooking on a tiled stove, which doubled as a sleeping platform on cold winter nights. 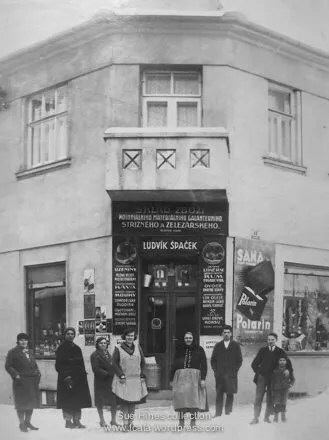 Luda Spacek’s general stores in Jundrov, Ondřej on right with small boy. After attending his first school in Lažánky itself, Ondřej walked five kilometres every day to and from the primary school in Veverská Bityška, down a steep hill through the woods. For the next phase of his education, he was academically successful enough to go to high school in Brno, boarding with his older brother Luďa, who was now married and working as the manager of a general stores in Jundrov, on the western edge of the city. A photo survives of Ondřej aged 16 standing outside his brother’s shop. By 1932, when Ondřej was 18 years old, he was expecting to join his brother in the business, and began attending a commercial college in Brno. However, by the time Hitler came to power in 1933 it was becoming clear that the future of Czechoslovakia might not be so secure after all. National defences had to be strengthened, and the development of an airforce was to be a key element in ensuring the survival of Czechoslovakia as an independent country. 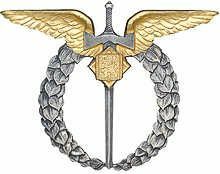 “Vzduch je naše moře” (“The air is our ocean”) became the motto of the Czech Air Force after World War I. It emphasised the fact that in the absence of a coastline, the skies around the Czechoslovak Republic would need strong defences in the event of war. The Czechoslovak aviation industry was innovative and advanced; T.G. Masaryk, the President, recognised the strategic importance of air power. The Masaryk Air League (MML), encouraged the formation of local flying clubs, publishing books and magazines aimed at drawing ambitious young men into a career in aviation. For Ondřej, who already possessed technical and mechanical skills, the opportunities offered by a career which promised the romance and excitement of flying must have looked irresistible. We know that he joined the Czech Air Force before World War II; it is possible that he chose it as the branch of the military in which he would do his national service. However, it was at this time that the government was promoting the scheme “1,000 pilots” as a way of ensuring that, in the event of war, there would be sufficient numbers of trained personnel ready to fight; Ondřej became one of these thousand young men. He would have flown biplanes during the 1930s. The Aero and Avia companies, both based in Prague, were producing machines which equalled those built anywhere else in Europe for power and speed. The Aero B-534 introduced in 1935, for instance, had a top speed of 240 mph and was still playing a vital role as late as the Slovak uprising of 1944. However, most of the aircraft Ondřej came to know well still resembled those that had taken part in World War I.
Czech airmen had an international reputation. František Novák, for instance, “The King of the Air”, along with his friend Petr Široky, appalled Marshal Goering at the 1936 Berlin Olympics by the clear superiority of his aerobatic skills to those of the German aces. Novák continued to win aerobatic competitions all over Europe until the 1939 German occupation. It was recognised by the German High Command that the Czech Air Force was the best-equipped in Europe, and had the most highly skilled pilots. They later admitted that German bomber crews had been frightened of the Czech fighter force. By 1937, Ondřej had completed his training as a pilot in the flying school at Nitra in Slovakia and in September 1938, he took part in the general mobilisation of Czechoslovak forces, a week before the Munich Agreement which left Czechoslovakia open to a Nazi invasion. By March 1939, he was taking part in reconnaissance patrols on the Slovak/Hungarian border, probably flying an Avia S-328 biplane. 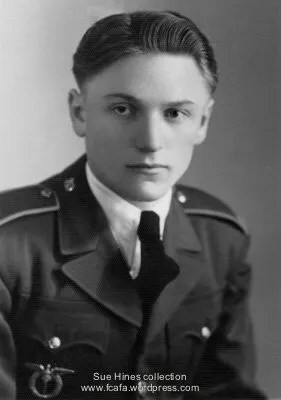 His observer was Ondřej Sandor, one of the Czechoslovak airmen who in September 1939 were the first to be killed in WWII at the Deblin airbase in Poland. However, Ondřej’s flying career was brutally cut short after 16 March 1939 when Germany occupied Czechoslovakia. With the disbanding of the Czech Air Force, he had only two options: either to fly for the Luftwaffe (only three pilots agreed to do so), or to be discharged and escape to the West in order to fight the Germans on another front. Until the right opportunity for the latter presented itself, he moved back in with his brother Lud´a and his family behind the shop in Jundrov. At some point during the next six months, he attempted to escape via Poland, but was stopped at the border and sent back, presumably in order to avoid provoking a reaction from the Germans if other airmen continued to do the same. By the summer, however, the Poles realised that they would soon be invaded and decided, too late, that they should have welcomed Czech assistance. By December 1939, German occupying forces had begun to crack down on potential Czech resistance. Student demonstrations in Prague were fired on and their leaders (Jan Opletal, for instance) were shot dead or sent to the Oranienburg concentration camp in Berlin; universities were closed; and SOKOL, the Czech youth organisation to which Luďa Špaček belonged, was about to be banned. In January 1940, Ondřej decided to leave his home country. Many Czech Air Force pilots had already escaped to Poland in 1939, but in order to get to the West from Brno now that this route was closed it was necessary to travel south. Ondřej probably took what was known as the ‘Balkan route’, through Slovakia, Hungary,Romania and Yugoslavia and from there by sea to Istanbul. From Istanbul, he travelled by sea via Beirut to Marseilles. A photograph survives of Ondřej on board ship, relaxing on deck with other Czech escapers. Czechs arriving there before the fall of France in June 1940 were enlisted in the French Foreign Legion ( foreign military units were not permitted on French soil during peacetime), enduring a brutal regime imposed by German NCOs who behaved scarcely better than the Nazis the Czechs had left behind. Ondřej remembered being in Agde, where the Czech forces were assembling, and in Sète, a few miles east, where Czechoslovak escapees were transferred to French military units. It is possible that he was sent to Tours, where the Czechs (by now in the French Air Force) were trained to fly missions against the invading forces of the German occupation. However, he seems to have ended up in Bordeaux with the remnants of the French Air Force before escaping to England. It was here that the nucleus of 311 Squadron was assembled at the Mérignac airbase as the Bordeaux Bomber Group. On 19th June 1940, he was evacuated by sea from France, with 92 other Czech airmen, aboard the ‘Ary Schaeffer’ and arrived in Falmouth on 23rd June. Czech Air Force airmen had been arriving in Britain since the middle of June 1940, landing initially at RAF Hendon. However, with 4,000 Czech soldiers and airmen coming to England over the course of the following few weeks often disembarking in Liverpool, the Czech government in exile chose Cholmondeley Park near Malpas in Cheshire as a base. From here, the airmen left for Cosford near Wolverhampton, via RAF Innsworth in Gloucestershire. Ondřej later met his wife Eileen at a dance at Wolverhampton Civic Hall, and spent the last 30 years of his life with her in Fallings Park, Wolverhampton. From this point in his life, Ondřej’s two surviving RAF logbooks help us to piece his story together. At first, like other Czech airmen, he was inducted into the Royal Air Force Volunteer Reserve (RAF VR) as a Pilot Officer. By April 1941, Ondřej was at RAF Brize Norton at the No. 2 Service Flying Training School, flying the Airspeed Oxford, a twin-engined monoplane used to train Bomber Command aircrew. Brize Norton had already lost 46 Airspeed Oxfords in a Luftwaffe raid in August 1940, and Ondřej was there when they were attacked again on 10 April. His first solo flight took place on 31 March 1941 and he went on to be trained in navigation, spot landings (including a forced landing at RAF Upwood in Cambridgeshire on 26 April), bombing runs and formation flying. By 2 July 1941, he had qualified for his flying badge, with his proficiency as a pilot being rated as “average”. 2 SFTS, Brize Norton, Summer 1941, Ondřej front row 2nd on right. Later that month, he began to convert to the Vickers Wellington, the most important bomber in the Royal Air Force before the arrival of the Avro Lancaster. Designed by Barnes Wallis, who also invented the bouncing bomb famously used by the Dam Busters, it was a revolutionary aircraft built using a complex interlacing skeleton covered with a fabric skin. It was robust and could be repaired quickly if damaged. Ondřej was next posted to 311 Squadron at RAF East Wretham, 6 miles east of Thetford in Norfolk. For the next four months, he flew training flights cross-country, learning how to fly blind, and practising bombing and night circuits, as preparation for nocturnal bombing raids. 311 Squadron was entirely composed of Czech airmen flying bombers. Formed at nearby RAF Honington in July 1940, its men flew more than 1,000 missions over Europe between September 1940 and April 1942. The fate of attrition, however, was high: 40% of its men did not return (273, more than half of the Czech airmen serving abroad, were killed and 34 were taken prisoner). This percentage was reflected in the fates of the men Ondřej flew with. Three members of his training crew (Karel Hurt, Bědrich Gissübel and Přibyslav Strachon) were later killed in action; eight other men he flew with also went on to be killed, including his commanding officer, Josef Ocelka. One of his comrades frequently took his dog, Antis, with him on missions. Originally from France, the dog had actually helped saved lives and had been, as widely reported in the press at the time, awarded the Dickin Medal, the highest award for animals displaying courage during wartime. A particularly tragic and mysterious accident occurred on a training flight in October 1942. Wellington T2624 disappeared over the Irish Sea; six men were lost, and only one body was ever recovered, that of František Dittrich. He had flown twice as navigator with Ondřej during the fortnight before his death, and like him had an English girlfriend. It was this young Englishwoman who took an urn containing his remains back to his hometown, Hradec Králové, in July 1946 for a funeral, after they had first been interred in the cemetery at Newquay, Cardiganshire. The body of Karel Hurt, Ondřej’s co-pilot since August 1941, was never found. Offensive missions began for Ondřej in December 1941. His first three raids were on the channel ports of Le Havre, Dunkirk and Ostend; the last operation of the year was to Wilhelmshaven, one of 217 missions over the same area of North German targets on the night of 28/29 December. In January 1942, 311 Squadron took part in a number of missions intended to destroy harbour and U-boat facilities in Brest, in Western France. Brest was also an anchorage for the German battleships Scharnhost and Gneisenau, and the battle cruiser Prinz Eugen. Ondřej flew seven missions to Brest, sometimes partnered by Sgt. Vladimir Para, who three months later was shot down and taken prisoner, and sometimes by Sgt. Bohuslav Hradil, who was killed two months later on the mission to bomb the Renault factories at Billancourt (which at that time were building 18,000 lorries a year for the German forces) near Paris in which Ondřej also took part. With 311 Sqn, Ondřej, 2nd from right. Over the next three months, Ondřej flew on missions to bomb Bremen, Muster, Essen, Kiel, Lübeck (where 200 bombers experimented with a new strategy of fire-raising which left the old city devastated), Cologne, Dortmund and Hamburg: 22 missions in all, curtailed on three occasions either by loss of instruments, electrical storms or engine trouble. Ondřej emerged unscathed from them all. By now, Bomber Command policy had begun to change. In February 1942, Air Marshal Arthur ‘Bomber’ Harris took over as commander and began to plan 1,000-bomber raids which would target entire German cities, rather than the military and industrial targets which, reconnaissance photos showed, had often been only partly damaged as a result of shortcomings in targeting equipment and bombs which failed to explode. In June 1942, Ondřej took part in the 1,000-bomber raid over Bremen. His Wellington was hit over the target; the port wing caught fire, and the hydraulics and air-conditioning were damaged. He was lucky to be able to return to England. At the same time, the threat to North Atlantic convoys from German U-boats had increased significantly. In the first six months of 1942, 21 U-boats had sunk 500 ships. It was decided that 311 Squadron, with the Wellington bombers which had proved more vulnerable than expected to German fighter planes, would from now on join RAF Coastal Command. The aircraft were to fly at 500 feet above sea level, forcing U-boats to remain submerged in order to evade detection and therefore to travel at slower speeds. Occasionally, submarines were actually sunk: for example, on 10 August 1942 a type VIIc U-boat, U578, was recorded as having been destroyed over the Bay of Biscay. From 30 April 1942, Ondřej was stationed at RAF Aldergrove in Northern Ireland, 18 miles northwest of Belfast. He remained there for two months, preparing for submarine attack missions. His logbooks record periscope bombing, firing and reconnaissance exercises, interrupted by the 1000-bomber raid on Bremen on 25 June mentioned above. The Wellington he flew to RAF Bircham Newton in Norfolk in preparation for the Bremen raid, Z1090Q, in fact crashed on Brancaster Beach on its return later that same evening, fortunately without loss of life, while being piloted by Sgt. Vratislav Zezulka, who had partnered Ondřej on eight missions over Germany earlier that year. 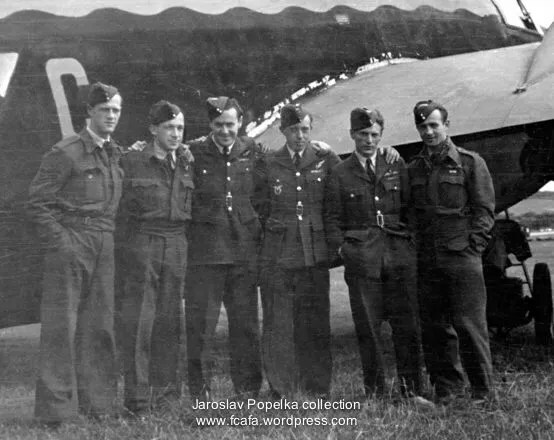 At the end of June 1942, Ondřej went with 311 Squadron to RAF Talbenny in Pembrokeshire. As is the case with many wartime airfields, little remains of this base,which reverted to agriculture after WWII. However, it was a crucial outpost for the anti-U-boat campaign, and for the rest of 1942 Ondřej flew a series of patrols searching for and attacking German submarines. Even more dangerous than the raids on Germany ( 156 losses for 311 Squadron, as opposed to 96 with Bomber Command), these patrols not only resulted in the loss of aircrew as a result of attacks by Luftwaffe fighter aircraft, but were subject to the inherent risks involved in flying out at sea in what were frequently hazardous conditions. For example, on 16 July Ondřej recorded his search for a dinghy, almost certainly as a result of the shooting down of a 311 Squadron Wellington over the Bay of Biscay. The aircraft lost had been 21155F, which Ondřej had flown himself a few weeks before and of the six Czech airmen lost, Hugo Dostal had been Ondřej’s co-pilot on his final mission over Hamburg in April. A few days later, 311 Squadron’s first C/O and Ondřej’s commanding officer, Josef Ocelka, was killed on take-off at RAF Brize Norton. These were particularly tragic times for the Czech RAF: on 18 October 1942, a 311 Squadron Wellington crashed just short of the runway at RAF Northolt, killing everyone on board. Among the 15 men who died was Bedřich Gissübel, who had been a member of Ondřej’s training crew at RAF East Wretham in 1941, and Antonin Bunzl, with whom he had flown at RAF Honington. As well as some dilapidated buildings and remnants of runways, the site of RAF Talbenny in Pembrokeshire is near to a small church in which a memorial plaque commemorates the Czech airmen who lost their lives while stationed there. Ondřej’s logbook records that on 30 November 1942, he took part in an attack on an Italian ship. The vessel was probably en route for North Africa, where the second battle of El Alamein had begun at the end of October. This was a 10-hour patrol, so it must have been at the limit of the Wellington’s range, but nothing more is recorded. It must have been for this action, on his final flight with 311 Squadron, that Ondřej was mentioned in dispatches for distinguished service. 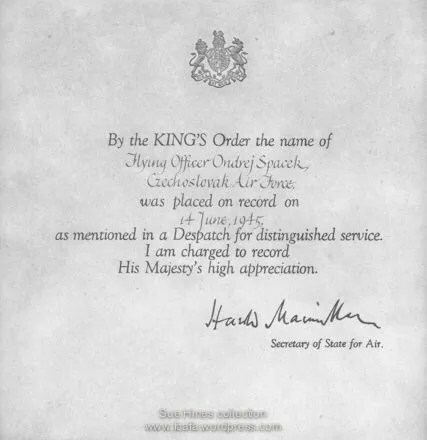 A framed certificate signed by Harold Macmillan (then Secretary of State for Air, later to be Prime Minister) on 14 June 1945 is still in the family. With this mission, Ondřej’s service with 311 Squadron came to an end. He had completed 204.25 hours with them and spent the rest of the war as a flying instructor. The Czech Air Force was aware that its numbers had been seriously depleted, and with no new recruits arriving from Occupied Europe it would have been necessary to conserve surviving aircrew. As happened with other pilots, Ondřej may therefore have been offered the chance, once his tour with 311 was completed, of moving into flying instruction. Such a move would also have made marriage a more secure prospect than if he had remained with 311 Squadron. Perhaps it was during the Christmas period in 1942 that Ondřej and Eileen were able to decide on a date for their wedding. In any case, he now had a much better chance of surviving the war and returning home. By the end of January 1943, Ondřej was stationed at RAF Woodley, near Reading. Now a housing estate surrounding a small aviation museum, it had been an aerodrome since WWI and as well as being the site of the Miles Aircraft factory, it now housed the No.10 Flying Instructors’ School. Ondřej found himself surrounded by English servicemen, as most of his Czech friends had been posted elsewhere. For the next two months, he flew the Miles Magister, a two-seat monoplane trainer designed to prepare pilots to fly Hurricanes and Spitfires, and the Tiger Moth, the legendary biplane which had been used both in training and on active service from 1932 onwards. One particularly interesting colleague, who seems to have trained him as a flying instructor, was R.A. Carr-Lewty. As well as having flown Spitfires during the Battle of Britain, he was an ornithologist keenly interested in the similarities of design between the wing feathers of the common snipe and the wings of a Spitfire. After the war, he trained as a doctor and ended his career as a GP in Scarborough. 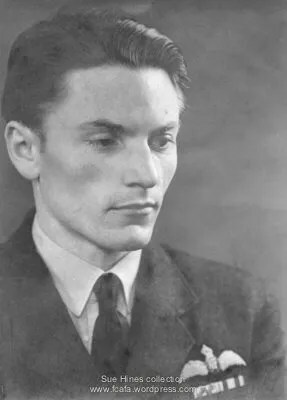 Karel Mazurek, a guest at Ondřej’s wedding in April 1943 who later worked in the aviation industry as Charlie Mazurek with Eileen’s cousin John Bellamy, trained alongside him. However, when Ondřej was assessed at the end of this period, his skill as a flying instructor was rated as ‘below average’. Almost certainly, this reflected his lack of experience as a speaker of English. His marriage to Eileen Bellamy on 10 April 1943 would change that. As many other Czechs discovered, English girls were far and away the best possible language teachers. Only three days after the wedding, Ondřej was flying again with No. 3 EFTS (Elementary Flying School) at RAF Shellingford, near Faringdon in Oxfordshire. For nearly six months, he flew nothing but Tiger Moths with some of his pupils being Czech. There were more than 30 of them, taught in small groups for a month at a time. All but one of them, Karel Macura (a Spitfire pilot who crashed near RAF Manston in 1945), went on to survive the war. At the beginning of October 1943, Ondřej and Eileen went to Scotland, where he continued to train as an instructor in the No. 2 FIS (Flying Instructor School) at RAF Montrose, staying there for two months. This time, the aircraft he used was the Miles Master II, an advanced two-seat trainer built at Woodley: fast, strong and acrobatic, it served as an excellent introduction for those pilots going on to fly Hurricanes and Spitfires. Once again, the Czechs had disappeared and been replaced by a series of English or Commonwealth airmen. Night flying, cine-filming and air firing were now among the more advanced skills he was expected to teach. 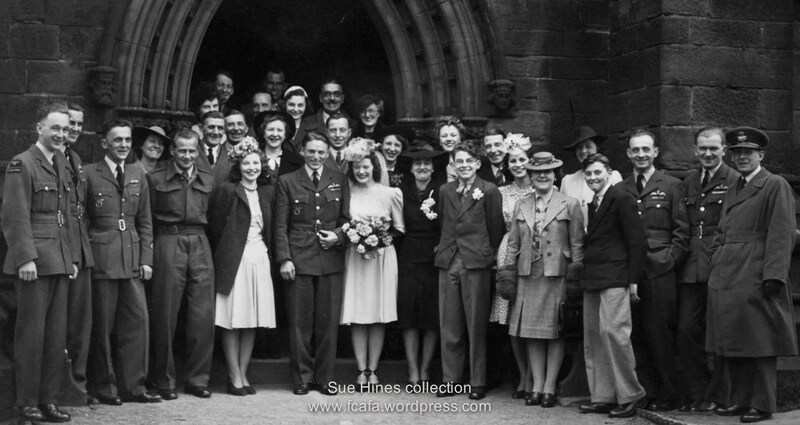 A week before Christmas 1943, Ondřej and Eileen moved south again, closer to Wolverhampton at RAF Ternhill near Market Drayton in Shropshire, where he would stay for most of the rest of the war, as an instructor at No. 5 Pilot Advanced Flying Unit (as FTSs had been renamed). 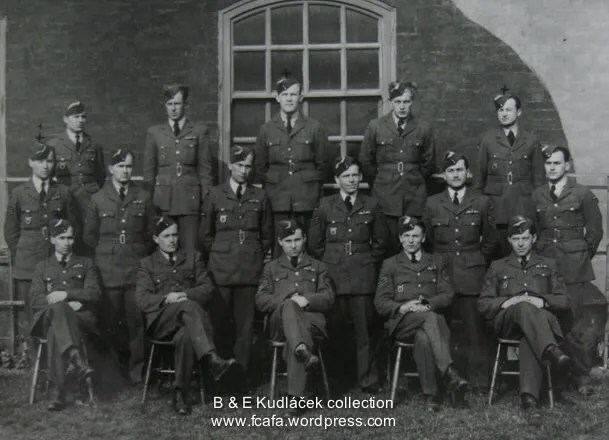 Perhaps because of the closeness of the base to the Czechoslovak HQ at RAF Cosford, his pupils were once again mostly Czechs, some of them familiar faces from RAF Shellingford. As well as the Miles Master II, he was by now flying the Harvard IIb trainer, an American aircraft built in Canada which was used extensively by Allied Air Forces throughout the 1940s and 1950s. In all, the RAF ordered 900 of them. After VE Day in May 1945, Ondřej recorded only two bases in his logbook: the Czech depot at RAF Cosford, where he was stationed from June to August 1945, and RAF Grantham,where for the first and only recorded time in his career, he flew a Spitfire, a Mark IIb. Having survived WWII, Ondřej might have expected his life to enter a more peaceful phase. However, an equally dramatic and dangerous period was about to begin. By now, Ondřej and Eileen were expecting the birth of a child, and Ondřej was settling into his new job as a flying instructor with the Czechoslovak Air Force. Based at Brno with the 3rd Division of the Air Force, he flew aircraft which were often Czech versions of German designs. The Avia company manufactured the C-4, a two-seater biplane which had been used by the Luftwaffe, and the C-2, a monoplane based on the German Arado Ar96, which had been the Luftwaffe’s standard advanced trainer during WWII. Soviet influence in Czechoslovakia (‘Trust Russia’ was a favourite slogan) made it impossible to import aircraft from the West, just as an offer of Marshall Aid (which helped to rebuild Germany after the war) was rejected by the Czechoslovak government, under Communist pressure. Ondřej seems to have been given a few days’ leave when, on 18th April 1946, Eileen gave birth to their daughter, Sue. When he returned to his duties, Ondřej had just a week or so at the Brno Military Flying School before transferring to another military flying academy, the VLA. At this point in May 1946, his flying logbook comes to an end. However, during these few days he does record a brief orientation flight with Josef Bryks, the celebrated RAF flyer and veteran of numerous escapes from POW camps. He was to see him again in court; they would be put on trial together two years later along with Air Marshal Karel Janoušek, supreme commander of the Czechoslovak RAF, and Jo Čapka, a 311 Squadron veteran who would later become a friend. At the end of 1946, Ondřej moved with his new family to Hradec Králové in north-eastern Bohemia, where a new Military Academy of Aviation for the Air Force had been set up after the war ended. They had an apartment in the New Town at Klumparova 833 which is still there. During the next 18 months or so, Eileen was able to improve her Czech and get to know other young mothers and their children. Her friendship with Mrs. Jarmila Sidlova, a teacher of English, later led to daughter Sue becoming the penfriend of her daughter Blanche, and her older daughter (also Jarmila) becoming a friend of the family up to the present day. Ondřej, Chouzavá and Sazavou, c. 1947. 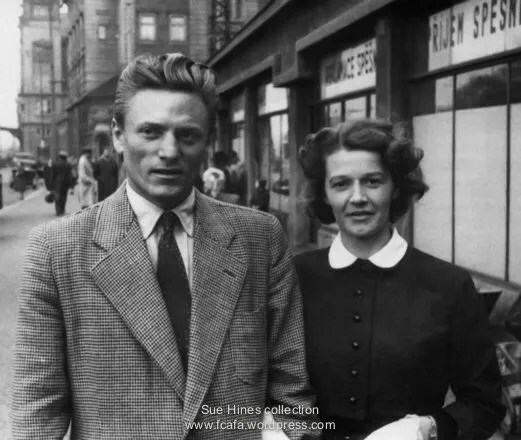 In 1947, Eileen and daughter Sue left Czechoslovakia for a brief holiday in England. A postcard survives sent to the Bellamys in Wolverhampton from the military college at Chocedy nad Sazavou, 45 km. 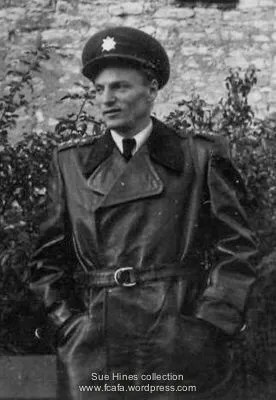 from Prague, along with a photo of Ondřej wearing a full-length leather coat and officer’s cap. By now, he had been promoted to Kapitan, or Flight Lieutenant. Pressure was beginning to grow on ex-RAF airmen to conform to Soviet-inspired demands that they sever all links to the West and submit to the authority of the Communist Party. Airmen with English wives were particular targets for suspicion and surveillance. 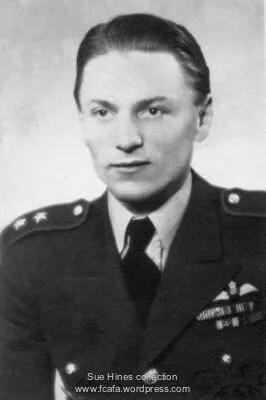 The Communist putsch of February 1948, which replaced a democratically elected government with one more obedient to its Soviet masters, made it increasingly difficult for Ondřej to continue in his Air Force career. It also made life increasingly dangerous for the whole family. It had become important for the new government to erase the history of the Czechoslovak RAF and its victory in the West; English wives were encouraged to return, leaving their husbands behind in the hope that a means of escape would be arranged for them. Serving personnel who had stayed in Czechoslovakia during the Nazi occupation kept their jobs, while Ondřej and men like him were being treated as criminals. While on enforced leave, they were investigated by the secret police before being dismissed from the service, stripped of their Czechoslovak medals and imprisoned – a process which continued into the 1950s. This was why, on 17 April 1948, Eileen and daughter Sue were put on a flight out of Prague, expecting that Ondřej would shortly be following them. Two weeks later, he was arrested. As he later described, he had made an attempt to escape across the border with a group of others into the American Zone of Germany. After waiting several hours for a general who would be joining them, they were apprehended before he appeared, somewhere in the Šumava forest South-West of Plzeň. 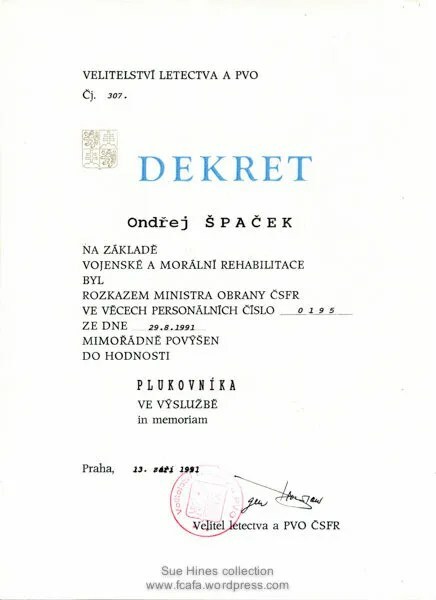 It is possible that Ondřej was a victim of a secret police agent, who may have been pretending to help him. A report of his initial trial on 17 June 1948 shows that his fellow accused included Air Marshal Karel Janoušek, Josef Bryks and Jo Čapka. Janoušek had been led into a trap by the StB agent Jaroslav Doubravsky, while Bryks and Čapka had been arrested in Olomouc. Whatever the actual circumstances, Ondřej and those arrested with him on 30 April 1948 were taken to the OBZ 5th Department military prison near Prague Castle on Kapucinska to be interrogated and tortured. Ondřej spent the next six weeks in the Little House, or Domeček, the StB interrogation centre in Prague, alongside other RAF fliers and ex-servicemen who had fought for the Allies, not to mention members of the Nazi SS, an irony not lost on those whose families had suffered at the hands of the Germans. Ondřej’s elderly parents, for example, had been sent to an internment camp while he was on active service in England. During this period, he was visited by Zdena Novákova and Milada Špačkova. Zdena was related to his sister-in-law Tonči in Jundrov by marriage and would go on to marry three times, becoming a good friend of the family and leaving her villa in Prague to Sue S after her death on Christmas Eve in 1994. Milada had married Ondřej’s brother Franta in Lažánky, and lived on until 2006. Ondřej was brought cigarettes and books, as well as messages from home. For his trial on 17 June 1948, Ondřej was transferred with the other men accused to Pankrac prison in Prague, which also had a large courtroom which soon afterwards became the setting for the notorious show trials of Milada Horakova, Rudolf Slansky and many others. Despite the lack of evidence against him relating to treason, espionage or desertion, he was rapidly found guilty and, like Bryks and Capka, sentenced to 10 years in prison. General Janoušek, having been in danger of being sentenced to death by hanging, received 18 years hard labour and was stripped of his rank, his medals and his doctorate. Appeals were lodged and a second trial took place on 9 February 1949, but the sentences were confirmed or increased, and finalised on 26 May. 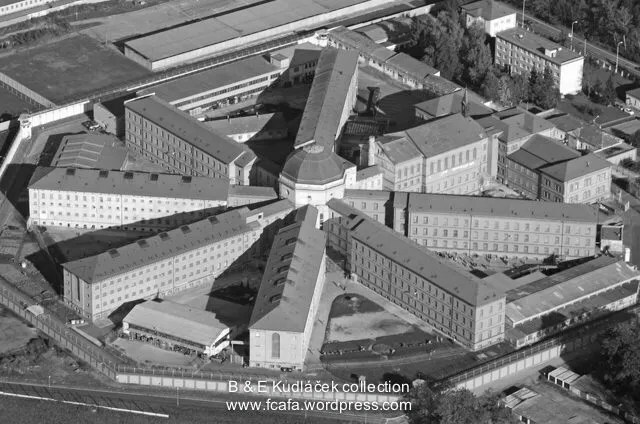 Ondřej began serving his sentence in Plzeň at Bory, where most of his first year was spent in solitary confinement. Jo Čapka in his book “ Red Sky At Night “describes how brutally they were treated: for one day every month they were given no food at all, for another day they were left in total darkness and for another their mattresses were taken away. In a letter to the producer of the BBC TV programme ‘This Is Your Life’ about Jo Čapka, Ondřej describes how they both tried to train houseflies to take crumbs from them. This had been Čapka’s idea and he had become quite successful: Ondřej’s flies were unfortunately less cooperative. This comic interlude, however, was entirely untypical of their experience in Bory. Prisoners were regularly beaten, deprived of sleep, denied food or forbidden to sit down; their families were threatened and their sanity undermined. Costa-Gavras’s 1970 film ‘L’Aveu’, based on Artur London’s autobiographical ‘On Trial’, vividly conveys the brutality and psychological pressure involved. Ondřej would have been aware of what happened to General Heliodor Pika. Having served as a Czech government attaché in Moscow, the General had known too much about how the Soviet Union had been supplied with intelligence by Zdenek Fierlinger, a Soviet sympathiser in Beneš’s wartime government, as well as about Stalin’s plan to incorporate Slovakia into the Soviet Union. Pika was hanged in the prison yard in Bory in 1949. Prison guards were usually sadists and often young, as more experienced officers were usually dismissed so that a harsher regime could be imposed. Ondřej spoke in later years about how he had dreamed of what he would do to these men if he ever met them again, but despite his experiences he resisted the temptation to feel bitter about his time in prison. For one thing, he was with friends; for another, after his first year in Bory he was moved to a much larger cell, which housed up to 30 prisoners. They included professors, clergymen and high-ranking officers whose conversation and companionship helped to restore some of the dignity and morale of those emerging from solitary confinement. Ondřej may have owed his life to one of them, a doctor before his imprisonment, who looked after him when he contracted pneumonia. Several of Ondřej’s letters to Eileen survive from this period, often written on printed forms (some of them with German headings, left over from the occupation) and occasionally struck through with black lines by the censors. When he could, Ondřej spent some of his time carving tiny scarab beetles from bone, or charms such as hearts or shoes from chewed and hardened bread. At some point during 1951, Ondřej was moved from Bory to the notorious prison camp in Jachymov, where prisoners were forced to work in uranium mines. The camp was modelled on the gulag system in the Soviet Union. Situated in the far north-west of Czechoslovakia, it helped to provide uranium for the Soviet nuclear programme, while housing prisoners in huts and subjecting them to brutal treatment. The slang term for the inmates was ‘mukl’, an acronym for ‘muž určeny k likvidaci’, the Czech equivalent of ‘dead man walking’. On the way from their huts to the mine entrance, up to 300 men were linked together by a steel cable in an arrangement known as a ‘Russian bus’. Uranium ore was handled without any protection, resulting in numerous cases of leukaemia and cancer. Life expectancy was about 42 years. There were also frequent accidents. Surrounded by two rows of barbed wire fencing 2.5 metres high and equipped with guard towers and searchlights, there were several different sections of the camp: Rovnost (Equality), Bratrstvi (Brotherhood) and Svornost (Concord). Nearby in Vykmanov was Section L, where prisoners were effectively marked for liquidation as it was where the uranium was broken up and packed for transport. It was here that Ondřej met members of the legendary Czechoslovak national ice hockey team who, despite having won the world championship twice running in 1948 and 1949, had been arrested and charged with treason. Seven of them were to die from the effects of forced labour in Jachymov. The town of Jachymov, in the valley below the site of the camp, expanded greatly in the early years of the twentieth century when it became a spa, specialising in radium treatment for patients with backache and joint pain. Its museum houses a section devoted to the prison camp, with a model of its layout and a variety of objects and documents that have survived. The camp itself is now virtually invisible under conifer plantations dating from the early 1950s, after it was closed. A waymarked path can be followed through the forest, allowing glimpses of concrete foundations and the remains of underground workings. The local name for the camp is ‘Jachymovske Peklo’, or Jachymov Hell. No letters from Ondřej survive from this period. They were reunited in March 1956 in Prague, visiting the family in Lažánky as well as Zdena’s cousins, the Cais family, in Litomĕřice. While in Prague, Eileen presented herself at the office of Zdenĕk Fierlinger, who was in close contact with the Soviet Union both during and immediately after the war and was now a prominent member of the Central Committee, having represented the ČSSR both in Washington and Moscow. It may have been this interview which proved decisive in making it possible for Ondřej to leave for England later that year. On her return to England, she also wrote to the Czechoslovak Ambassador about her reunion with Ondřej, with a view to softening the attitude of the authorities towards him. Like Fierlinger, Jiři Hajek had been a social democrat before WWII and a communist afterwards, but unlike him he went on to align himself with the dissident movement of the 1970s and 1980s, signing Charta 77 along with Václav Havel. During the summer of 1956, permission must finally have come through. The timing was fortunate; there had been a brief period of thaw in the ČSSR’s relations with the West, shortlived but instrumental in securing Ondřej’s release. Inspired by Nikita Khrushchev’s ‘secret speech’ in February to the 20th Party Congress in Moscow, the repressions of the Stalinist era had been brought into question, though when the climate of reform this change inspired led to the Hungarian Uprising in November 1956, it was repressed mercilessly and a long period of freeze ensued. It was to be his final flight. Once reunited with Eileen and Sue, he began to look for a job in aviation. However, technology had moved on so quickly in the post-war years that his expertise had become outdated. His heavily-accented English was no doubt a factor in his failing to find any employment that made appropriate use of his skills and talents. Instead, he went to work in the Goodyear tyre factory in Wolverhampton, until finally finding a post as a technical assistant in a secondary school in Wednesfield. Ondřej became a British citizen in 1962, and for the rest of his life was able to make annual visits to his family in Czechoslovakia. He kept in touch with RAF comrades in England, but avoided any activity which might have resulted in difficulties for his family, or a refusal of permission for him to return. He retired in 1979 and died in 1987, less than three years before the Velvet Revolution which restored democracy to Czechoslovakia. 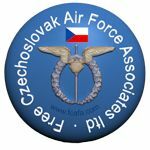 On 13 September 1991, the RAF Rehabilitation Ceremony was held in Prague to honour the Czechoslovak personnel who had served in the RAF during WW2. At this ceremony Ondřej was promoted, in memoriam, to the rank of plukovník (Group Captain) in the Czechoslovak Air Force. 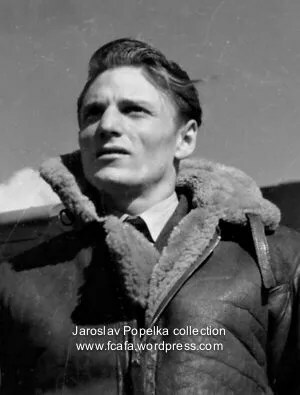 Like his RAF and prison comrades, Ondřej Špaček will be remembered for his courage both during and after WWII. Like them, he played a unique and unforgettable role in the history of his country. This entry was posted in 311 Sqd, Anniversary, Biography. Bookmark the permalink. A wonderful and detailed write-up of your father’s story, Sue. It gives an excellent overview of the history of Czechoslovakia during these turbulent years, with a detailed insight into the situation during the ‘closed’ era of communism. Your father was a truly brave man who fought and suffered much in order to establish freedom and democracy in Czechoslovakia and, sadly,one who never lived to see the fruit of his labour in his land of birth.